Female shape-shifters in the movies tend to be highly sexualized, like Nastassia Kinski in the Cat People remake or Sybil Danning in Howling II. In contrast, Marie is pretty repressed, but she is a product of her coastal Danish environment. You could easily imagine John Calvin preaching in their wooden church. 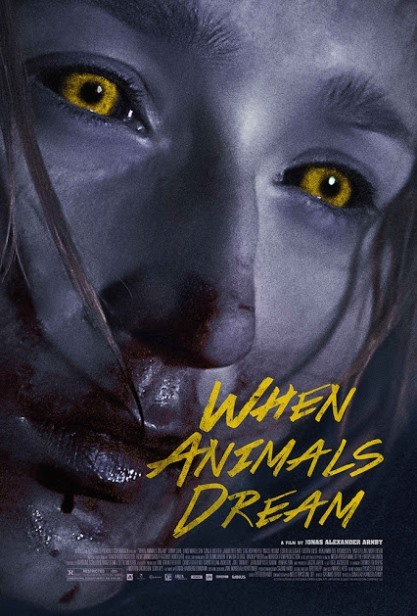 However, she will undergo some dramatic changes in Jonas Alexander Arnby’s When Animals Dream (trailer here), which opens this Friday in New York. As the film opens, Marie is rather concerned about a persistent rash and strange tufts of hair growing in places where they shouldn’t be. Her elevated stress level will not help. She has just started work at a fish cannery, which is even less glamorous than it sounds. She makes fast-friends with a couple of the cool kids, including Daniel, who might even be potential boyfriend material. Unfortunately, she also quickly finds herself on the wrong end of the sexual harassing “pranks” of the sociopathic Esben and his cronies. Frankly, the entire village is rather standoffish towards Marie. They fear she will turn out to be her mother’s daughter. For some time, her father has kept her formerly wild and beautiful mother zoned out on tranquilizers and anti-psychotic medication. Of course, when her werewolf nature starts to assert itself, the village doctor inevitably prescribes the same treatment for her, with her father’s acquiescence. WAD is a wildly moody, thoroughly hypnotic, revisionist feminist take on lycanthropy. There will be plenty of painful deaths down the stretch, but it is more a riff on the mad-woman-in-the-attic trope than an exercise in gore. Nevertheless, when the film gets down to snarling business, it is unabashedly cathartic. Lycanthropy as feminist survival strategy is all very good, but it is Sonia Suhl who really sells it as Marie. Beautiful, but in a freakishly ethereal way, Suhl’s very presence is unquantifiabaly disconcerting. Yet, she still gives an impressively real performance in her feature debut, viscerally expressing all of Marie’s social awkwardness and pent-up resentment. It is her movie, but the other Mikkelsen (Mads’ brother Lars) adds further layers of anguished ambiguity as Marie’s father, Thor, who will slowly strangle his loved ones to ostensibly save them from the potential mob with pitchforks that constitute their village. Hollywood could conceivably remake WAD, but it has a distinctly dark, Scandinavian soul. There is a Nordic chill in its bones. Northern Jutland native Suhl also could not possibly be anymore Danish. As horror films go, WAD is definitely a slow build, but it is also a steady build that pays off handsomely. Recommended for adventurous werewolf fans, When Animals Dream opens this Friday (8/28) in New York, at the Village East.